Are saccades (rapid eye movements) synchronized to speech during lipreading? Now I am reading the book “Visual Thinking for Design” by Colin Ware (ISBN 978-0-12-370896-0). The book starts by describing the way the brain processes visual information. Essentially, the brain processes it chunk by chunk, where the chunks are separated by saccades (rapid eye movements). Since my V2V project requires finding a way to translate auditory information into visual information for processing by the brain, I’m looking also for the corresponding information about the way a brain processes auditory information. One question, which arose in my mind, as I am reading the aforementioned book is as follows. Assume a hearing (or hard of hearing) lipreader, who follows a speech by listening and uses lipreading as an auxiliary aid to filter out environmental noises and other speakers. Given that the lipreader’s eyes perform saccades as usual, are the saccades synchronized to times at which the speaker produces vowels rather than consonants? And would the saccades still by synchronized to vowel production periods also for a deaf lipreader? Author Omer ZakPosted on 2013-11-14 Categories crazy ideas, deafness, science, V2VLeave a comment on Are saccades (rapid eye movements) synchronized to speech during lipreading? I wonder if there is any research about the placebo effect itself. Under which circumstances, will the placebo effect be stronger? Which personality traits make someone more susceptible to the placebo effect? Is there correlation among hypnotizability (ability to get hypnotized) and susceptibility to the placebo effect? Delatura is Latin for information (well, according to Google Translate FWIW). Delaturomedicine is my proposed name for a proposed new branch of medicine. What is common to nuclei, neurons, the immune system and the digestive system? All those systems store information which causes the body to change its behavior. Nuclei store information in their DNA. There are also various chemicals which bind to the DNA strands and which modify the degree in which the genes express themselves and affect the cellular behavior. That neurons store information is obvious. The immune system learns its opponents – germs and viruses – and prepares the appropriate antibodies to fight them. We learned to teach not only our youths’ neurons but also their immune systems. Those courses of study are known as vaccinations. The digestive system also learns how to digest new kinds of foodstuffs. All of us are experienced with the slightly upset stomach when we eat unfamiliar foods or unfamiliar mixtures of foods. This is because our digestive system does not know yet how to cope with the unfamiliar mixtures which pass through it. Information is passed between various body systems by means of neuronal signals and hormones. Some medicines operate by signalling body subsystems like hormones. The analogy to machines, such as cars and cellphones, with embedded microcontrollers with firmware and writeable memory is obvious. What happens if something goes wrong with the information stored in those systems? If genes have mutations, we suffer from various genetic ailments and from cancer. If neurons malfunction, the effects range from loss of consciousness to mental illnesses to various impairments of bodily functioning. If the immune system malfunctions, we are either vulnerable to diseases or our antibodies attack our own bodies. I do not know what happens when the digestive system stores the wrong information. How are those malfunctions fixed? Gene therapy. Hormones. Electrical stimulations. Maybe the more successful among alternative medicine practitioners succeed because they stumble by chance upon procedures, which happen to reprogram information-carrying systems in our bodies. The analogy to reprogramming a buggy cellphone by reflashing its firmware is obvious. דלאטורה זו מילה לטינית שפרושה מידע (לפחות לפי Google Translate עד כמה שזה שווה). דלאטורורפואה זה השם שאני מציע לענף חדש ברפואה. מה משותף לגרעיני תאים, נאורונים, המערכת החיסונית ומערכת העיכול? כל המערכות האלה מאחסנות מידע שגורם לגוף לשנות את התנהגותו. גרעיני תאים מאחסנים מידע ב-DNA שלהם. יש גם כל מיני כימיקלים שנקשרים לשרשראות ה-DNA ומשנים את המידה שבה הגנים מבטאים את עצמם ומשפיעים על התנהגות התא. מן המפורסמות שהנאורונים מאחסנים מידע. המערכת החיסונית לומדת את האוייבים שלה – חיידקים ונגיפים – ומכינה את הנוגדנים המתאימים למלחמה בהם. למדנו ללמד לא רק את הנאורונים של הצעירים שלנו אלא גם את המערכות החיסוניות שלהם. קורסים לימודיים אלה ידועים בתור זריקות חיסון. גם מערכת העיכול לומדת איך לעכל סוגי מזון חדשים. כלונו התנסינו בכאבי הבטן הנגרמים על ידי אכילת מזונות לא מוכרים או תערובות לא רגילות של חומרי מזון. כאבי הבטן נובעים מהעובדה שמערכת העיכול שלנו עדיין אינה יודעת איך להתמודד עם התערובות הלא מוכרות שעוברות דרכה. מידע עובר בין מערכות גוף שונות על ידי אותות חשמליים העוברים דרך נאורונים וכן על ידי הורמונים. כמה תרופות פועלות על ידי איתות למערכות גוף, כמו הורמונים. האנלוגיה למכונות, כמו מכוניות וטלפונים סלולריים, שיש בהם מעבדים משובצים עם קושחה וזכרון שניתן לכתיבה, הינה מובנת מאליה. נשאלת השאלה מה קורה אם משהו משתבש עם המידע המאוחסן במערכות אלה? אם יש מוטאציות בגנים, אנו סובלים ממחלות גנטיות שונות וגם מסרטן. אם נאורונים אינם מתפקדים כהלכה, ההשפעה נעה בין אובדן הכרה למחלות נפש לשיבושים של תפקודי גוף שונים. אם המערכת החיסונית אינה מתפקדת כהלכה, אנו מאבדים את החסינות נגד מחלות, או שלחלופין הנוגדנים שלנו תוקפים את תאי הגוף שלנו. לא ידוע לי מה קורה כשמערכת העיכול מאחסנת את המידע הלא נכון. איך מתקנים תקלות כאלה? תרפיית גנים. הורמונים. גירוי חשמלי. ייתכן שהמרפאים האלטרנטיביים היותר מצליחים – מצליחים כי במקרה עלו על שיטות טיפול, שבמקרה מתכנתות מחדש בצורה נכונה מערכות גוף שמאחסנות מידע. האנלוגיה לתיקון טלפון סלולרי מקולקל על ידי צריבה מחדש של הקושחה שלו – מובנת מאליה. Few weeks ago I bought a new netbook. I wanted it to serve also as my encyclopedia. The solution is to install on it offline Wikipedia. Inbar Hovav explained, in her Hebrew language blog, how to accomplish this using kiwix. לפני כמה שבועות רכשתי נטבוק חדש. רציתי שזה ישמש אותי גם כאנציקלופדיה. הפתרון הוא להתקין עליו גירסא לא מקוונת של הויקיפדיה. ענבר חובב הסבירה בבלוג שלה איך לבצע זאת תוך שימוש ב-kiwix. An Accessible Popular Science Lecture – a treat! 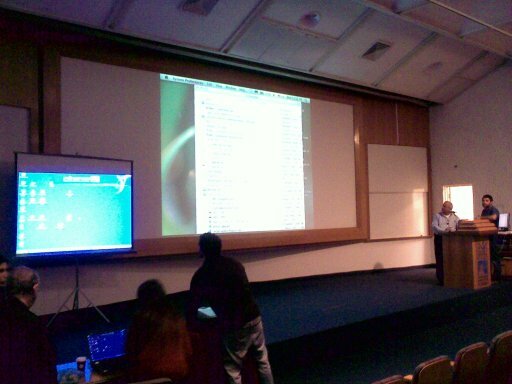 Today I was in Weizmann Institute of Science, to attend a popular science lecture. The lecture’s topic was “The role of molecular traps in plant behavior”, and the reason I went to this particular lecture was because Mrs. Rina Tzoref arranged for it to be accessible. The subject was put in the context of the Green Revolution, which freed humanity from hunger due to shortage of agricultural produces. However, population growth continues and agriculture needs to be even more efficient. Currently, out of the theoretical yield, only about 60% gets consumed by people. The other 40% are lost to weeds, pathogens (fungi, bacteria, viruses), insects and other animals. In addition, it is also necessary to defend plants against plagues. For example, the pathogen involved in the 1845-1849 Irish Potato Famine has made a comeback. There is also a new pathogen from Africa, which infects wheat plants, and against which there is no currently known cure. Therefore, it is very interesting to know how do plants defend themselves against pathogens and insects. Most of the lecture dealt with those defense mechanisms. Author Omer ZakPosted on 2010-12-15 Categories accessibility, events, scienceLeave a comment on An Accessible Popular Science Lecture – a treat! The story starts at the late 1980’s, at which time I did my M.Sc. work under Prof. Jacob Klein. It was a strike of luck for me, as I did not set out to look for a top notch advisor, but ended up having such an advisor. Twenty years later, as one of his former M.Sc. students, I was invited to a workshop, which was dedicated to his 60th birthday, and which was held between 21-23 June this year. I was happy to attend it, soak some science, and meet old acquaintances. The workshop was relatively small and intimate. There were few tens of participants, and several of them also lectured and presented posters. Most of them were students, collaborators or colleagues of Prof. Klein. At the workshop’s end, people remarked about the high quality of research described in the lectures. Scientists were also not afraid to venture forth from their zones of comfort and discuss also subjects about which they did not have all the answers. So one could notice that some post-lecture questions were answered by “I do not know”. Rachel Yerushalmi-Rozen, one of the workshop organizers, arranged for me full coverage of notetakers so that I could follow all lectures. They did good enough work so that I was not bored, even though fundamental cognitive and motor limits of humans prevented them from writing down everything that was being said during the lectures. The notetakers had to be proficient with the terminology used in the lectures, so they were students of the workshop’s organizers. The first part of the workshop was held in Schmidt Auditorium in Weizmann Institute of Science, and when it ended, a group photo of the participants was taken. Such group photos often end up in biographies of scientists, who participated in them. The caliber of the workshop’s participants was such that several of them are current or future prominent scientists. In one of the evenings we were treated to a dinner and a rare night visit in the Jerusalem Biblical Zoo (see also in the Wikipedia: http://en.wikipedia.org/wiki/Jerusalem_Biblical_Zoo). After the night tour, still in the zoo, Prof. Klein blew out candles on his birthday cake and we were treated to a presentation of photos of highlights of his life, so that the 3-day workshop would qualify also as a birthday party. As I was enjoying the article DNA seen through the eyes of a coder, a link caught my eye and it directed me to Ensembl Human Web site, which lets you explore the Homo sapiens genome. The home page showed the usual 23 chromosome pairs. However I was startled to find yet another chromosome mentioned – MT. I made the quick guess that it is the mitochondrial chromosome, and wanted to confirm or refute this guess. However, the Web site search function yielded nothing when I looked for the phrase “chromosome mt”. I was provided instead with a form for sending E-mail to the Web site’s helpdesk. I took advantage of this. Few minutes later, they answered me – yes, it is indeed the mitochondrial chromosome. The comment woke in me nightmare past memories of a primary school teacher in USA, who subscribed to the DEAF-L mailing list (a mailing list devoted to deafness related issues), but her censorware filtered out innocent messages because they included phrases, which could have been interpreted in objectionable ways. And furthermore, there was no way to bypass the censorware to tell her that a legitimate message has been blocked. Yesterday I spent all day reading Sue Ellen Pressman’s Ph.D. dissertation “A NATIONAL STUDY OF DEAF ENTREPRENEURS AND SMALL BUSINESS OWNERS: IMPLICATIONS FOR CAREER COUNSELING”. As far as Pressman and I know, this is the first time such a study was undertaken. I have a methodological note: the study claims to be based upon a representative sample of the deaf entrepreneurs in USA. However this claim is not supported by the methodology used. The sample was self-selected by consent to answer a questionnaire, and by being member of (or known to) Deaf and hard of Hearing Entrepreneurial Council (DHHEC) i.e. included in DHHEC’s mailing list. There also seem to be few non sequiturs. Most entrepreneurs had some postsecondary school experience (some of them having college degree), but it does not by itself imply necessity of postsecondary school experience for success in business. Similarly, the fact that most of the entrepreneurs use voice to communicate with hearing customers and employees – does not by itself imply that voice is necessary or advisable for business success. Deaf entrepreneurs usually had hearing employees and hearing customers. Percentage of college graduates among Deaf entrepreneurs is higher than that among hearing entrepreneurs. To communicate with hearing employees and customers, about 60% of the Deaf entrepreneurs used writing. Cultivation of relay services goes together with development of deaf owned businesses. There is a problem (not mentioned in the study) of lack of mutual trust among the Deaf in business, at least in Israel. In USA, there is now a battle between science supporters and “Intelligent Design” supporters over incorporation of “Intelligent Design” in science education standards. See, for example, Creationism in the Classroom: Florida and Texas, Then the Nation. Due to the fundamental role of evolution in understanding biological processes, may I suggest that venture capitalists, investors and businesses specializing in medical, pharmaceutical and biotech technologies – boycott districts, states and countries, in which the educational establishment promotes “Creationism” and “Intelligent Design” over objections by scientists. Furthermore, it would be a good idea to move existing factories out of those regions, in which the educational establishment does not meet its duty of educating, in science, future employees for those establishments. 2008 Mar 04 update: see also Creationist Biologist Says Civil Rights Violated by Employer’s Insistence on Evolution. This is a case, in which a research establishment, in which evolution plays a fundamental role, was sued by a creationist, who was asked to resign from his job there after revealing his creationist beliefs.